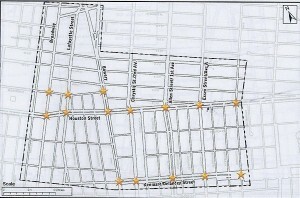 With better than a 5,000 population increase in residents and a multi-fold increase in nightlife, tourist and hotel visitor traffic the Bowery-Houston corridors have realized extreme congestion and an alarming increase in accidents and deaths. Interestingly enough residents in the study area walk and take subways more than the average Manhattanite…and use a car way-less frequently, making the traffic increases all the more notable. Having alerted the Department of Transportation to this probability more than 10 years ago, as development and nightlife licensing was rapidly increasing, the NoHo Neighborhood Association with a real assist from Charle Cafiero and support from Shirley Secunda, now Chair of CB#2’s Traffic and Transportation Chair, secured funding for a major study. Two years ago the study was finally launched and the study area increased to include a broader swath of Bowery-Houston communities. Last month we were briefed on the preliminary results and potential remedies to what is now recognized as a major NYC traffic hotspot. Community concerns regarding congestion, bicycles and pedestrians, safety, parking and construction have so far yielded 15 locations the study has pinpointed for necessary improvements; among them are Broadway at Bleecker, Broadway at Houston, Lafayette at Bleecker, Lafayette at Houston, Bowery at Bleecker, Bowery at Houston, Second Ave/Chrystie at Houston as well as some tragically dangerous intersections on the Lower East Side, the worst of which is Delancey at the Manhattan Bridge. You can see the presentation here. Another community meeting with further study results and more specific remedies will occur in late June.